Adu practices his game day routine. 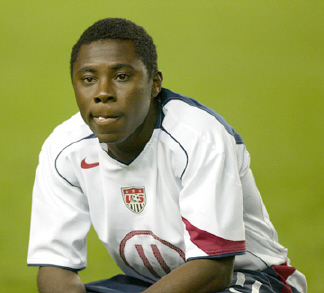 Freddy Adu on the move again, as Portugal’s last place team reportedly ends his loan and sends him back to Benfica, Goal.com reports. In related news, Twitter explodes. Belgium team Excelsior Mouscron kicked out of Belgium’s top division after collapsing mid-season with debts of €800,000, according to ESPN. All their players become free agents, rather than lasting another week for a fire sale. Edwin van der Sar leaves Manchester United temporarily after his wife has a brain hemorrhage. Scotland cancels games due to freezing weather. Sepp Blatter’s desire to see MLS play a European-style calendar looks smarter every day. Moroccan ref Khalid Ramsis knocked out with serious head and neck injuries in a match between DHJ El Jadida and FUS Rabat. See video after the jump.